California Bill AB 1327: Don’t wait for courts to place limits on drone surveillance. States shouldn’t wait until courts weigh in to place limits on drone surveillance. 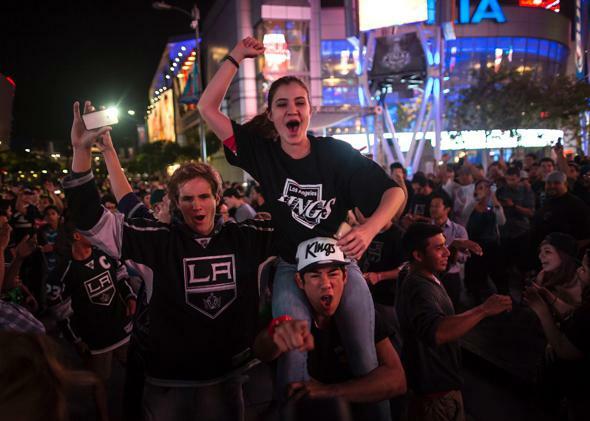 Kings fans celebrate the team’s Stanley Cup victory in Los Angeles in June. At one point, revelers noticed a small drone overhead and, thinking it was operated by the LAPD, threw clothing and shoes at it, eventually knocking it out of the sky. In June, a Los Angeles crowd was celebrating the Los Angeles Kings’ Stanley Cup victory when people noticed a small drone overhead. It appears that members of the crowd thought the drone was operated by the L.A. Police Department. They threw clothing and shoes at the aircraft and eventually knocked it out of the sky. While that particular drone was not police-owned, both the LAPD and the San Jose Police Department do own drones. The LAPD received its drones free of charge from the Seattle Police Department, which decided it could not use the equipment because of extensive public outcry. The San Jose Police Department purchased its drone in January for $7,000 but recently apologized for failing to notify the affronted local community about acquiring the aircraft and its intended use. Surveillance is about power, and police power is a sensitive topic in America right now. Low-cost surveillance enables law enforcement to track unwitting citizens, target and alienate marginalized communities, develop profiles on individuals, and use information out of context in ways that threaten both privacy and First Amendment freedoms. Drones bring the added baggage, rightly or not, of being associated with militarization. Throwing a T-shirt at a drone is not a prank; it’s a protest—albeit a protest that could get you in serious trouble for destroying somebody else’s property. The California Legislature has taken the pulse of its citizens and decided to regulate law enforcement drone use. Otherwise, police use of drones for aerial surveillance will operate in an unchecked legal gray zone. Bill AB 1327 requires law enforcement drone-users to get a warrant. A warrant requirement does not prevent law enforcement from using drones, which are cheap and useful technology; it checks the scope of drone surveillance by involving legal standards and a judge. California’s drone bill is not draconian. It includes exceptions for emergency situations, search-and-rescue efforts, traffic first responders, and inspection of wildfires. It allows other public agencies to use drones for other purposes—just not law enforcement. If California Gov. Jerry Brown decides to sign the bill, California will join 13 other states in regulating law enforcement drone use. Many of these state laws have similar exceptions and received bipartisan support from both governors and legislatures. The bill now rests in Brown’s hands. But the governor, who has vetoed multiple electronic privacy bills in the past, appears to fall in the camp of people who believe new technology should be addressed not by state legislatures but by courts. This is not an unreasonable position. When new technology raises privacy issues, there are pros and cons to legislating—just as there are pros and cons to waiting for court decisions. On the one hand, waiting for courts ensures that you do not deprive law enforcement of valuable and constitutional technologies, and that courts get a chance to address underlying constitutional concerns. On the other, legislation expresses the popular local will and can provide clear, detailed rules in advance, while court decisions take a very long time and can be less informed. In the meantime, both law enforcement and citizens live without clear legal guidance, often while the new technology is deployed without constraint. The same concerns have been raised about law enforcement use of drones. There are no guarantees of how courts will come out on drone use. Like GPS tracking, it’s a complex issue, and there are old cases giving little credence to the notion that we have privacy rights in public. But the newest Supreme Court cases push back against this, showing a more sophisticated understanding of dragnet digital surveillance and privacy. One guarantee is that court decisions will take time—and there are costs to waiting for courts to make up their minds. In 2011, the California Legislature passed a bill requiring a warrant for the search of cellphones at the time of arrest. Gov. Brown vetoed it. It took three years for the issue to work its way up through courts, only for the Supreme Court to find this summer in Riley v. California that a warrant is required for exactly that kind of search. The opinion was 9–0. In the meantime, Californians were subject to unconstitutional searches without legal protection. Alito, writing in U.S. v. Jones, noted that “[i]n circumstances involving dramatic technological change, the best solution to privacy concerns may be legislative.” I and 40 other law professors—in criminal procedure, privacy, and First Amendment law—have written to Brown in support of AB-1327’s warrant requirement. This is an example of good privacy lawmaking. People are concerned, and the California Legislature is responding. Besides, better a warrant requirement than airborne T-shirts and shoes.